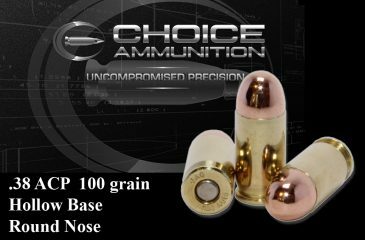 .380 Auto 100 grain plated Flat Base Round Nose~ Plated flat base bullets are designed for shooters who need increased velocity. The flat base provides more contact area with the powder to increase velocity. With the right ammunition, a .380 can produce effective results based on objective test data. Is it as versatile as a double-stack 9mm? No, but it’s also easier to carry, and that’s the limiting factor for many shooters. With the surge in concealed carry legislation in many of our nation’s states, smaller pistols chambered in the proven .380 ACP (Automatic Colt Pistol) caliber are becoming more popular with civilians and law enforcement. The .380 ACP cartridge was developed by John Browning and introduced in 1908 by Colt, which chambered this round in small pocket pistols that quickly gained popularity in undercover police work. Many shooters have also chosen the .380, because of its pleasant recoil characteristics as compared with the 9mm Luger and its bigger cousins. The .380 can be snappy when shot out of a small-frame pistol and is still much more of a pleasure to shoot than its larger cousins. While not the least expensive .380 ammunition on the market, our tight loading tolerances, visual inspection and premium performance sets our products apart from other import and “factory” loaded ammunition! For a few cents more, make every shot count! .380 Auto 100 grain plated Hollow Base Round Nose~ With the right ammunition, a .380 can produce effective results based on objective test data. Is it as versatile as a double-stack 9mm? No, but it’s also easier to carry, and that’s the limiting factor for many shooters. With the surge in concealed carry legislation in many of our nation’s states, smaller pistols chambered in the proven .380 ACP (Automatic Colt Pistol) caliber are becoming more popular with civilians and law enforcement. Plated hollow base bullets are designed for shooters who need increased accuracy. The hollow base allows the bullet profile to be longer and provides more contact area with the barrel and rifling to stabilize the bullet and improve accuracy. These high-performance plated rounds provide excellent reliability, consistency and accuracy for Range and Practice time for this caliber. 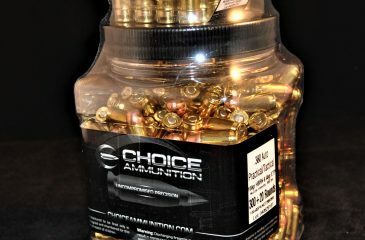 While not the least expensive 9mm ammunition on the market, our tight loading tolerances, visual inspection and premium performance sets our products apart from other import and “factory” loaded ammunition! For a few cents more, make every shot count! This combination pack of Practical Range Ammunition and Tactical Self-Defense Ammunition is the perfect mating of “Trigger Time” and “Business Time”. The 100 grain Plated hollow base bullets are designed for shooters who need increased accuracy. The hollow base allows the bullet profile to be longer and provides more contact area with the barrel and rifling to stabilize the bullet and improve accuracy.Both the Plated hollow base and XTP were paired and developed to perform exactly the same, both in feel and most importantly, in point of aim/point of impact. So if the time ever comes, there will be no surprises. 500 rounds of 100 grain Plated Flat Point Bullets. Swaged and plated to final weight and re-struck for accuracy and precision. 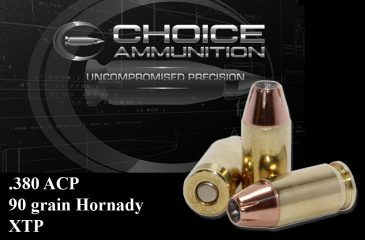 With performance similar to our standard ammunition, these rounds are dependable, accurate and affordable enough for practice. 20 rounds of 90 grain Hornady XTP Bullets feature a performance-improved point that has 6 precise folds to divide the bullet into symmetrical sections and initiate controlled expansion at low velocities while not fragmenting at higher velocities. They expand reliably at a wide range of velocities for a deep, terminal penetration with every shot. 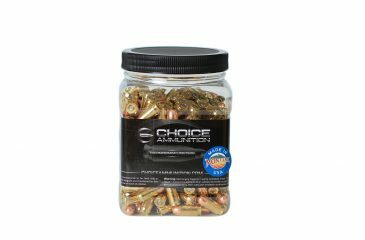 .380 Combination Range Ammo and Self Defense Ammo-This combination pack of Practical Range Ammunition and Tactical Self-Defense Ammunition is the perfect mating of “Trigger Time” and “Business Time”. 300 rounds of 100 grain Plated Flat Point Bullets. Swaged and plated to final weight and re-struck for accuracy and precision. We take every single round seriously. This is why even our inexpensive target rounds are 100% hand-loaded with the same reliability and consistency as our Defense Ammunition. .380 Auto 90 grain Hornady XTP- Hornady XTP Bullets feature a performance-improved point that has 6 precise folds to divide the bullet into symmetrical sections and initiate controlled expansion at low velocities while not fragmenting at higher velocities. They expand reliably at a wide range of velocities for a deep, terminal penetration with every shot. .380 Auto 90 Grain Hornady XTP Bullets feature a performance-improved point that has 6 precise folds to divide the bullet into symmetrical sections and initiate controlled expansion at low velocities while not fragmenting at higher velocities. They expand reliably at a wide range of velocities for a deep, terminal penetration with every shot.